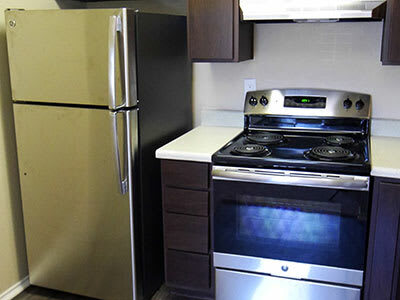 Creekside Apartments specializes in providing accessible homes for residents in the Fort Worth area. With studio, one, and two bedroom apartments, we’ve curated homes that accommodate your lifestyle. Whether you prefer the simplicity of a studio apartment, the space and design of a one bedroom, or the comfort of living with a roommate or family members in a two bedroom, your next home awaits you at Creekside Apartments. Inside the apartment homes at Creekside Apartments, you’ll find desirable features designed to make your daily life easier. Air conditioning and ceiling fans help create the perfect climate inside your home, while walk-in closets accommodate the entirety of your wardrobe and provide ample storage space. Select homes include washer/dryer connections, which grants you the luxury of doing laundry from the comfort and privacy of your own home. For a warm ambiance, choose an apartment with a fireplace, a perk you will love during winter months. Browse the selection of studio, one, and two bedroom apartments for rent at Creekside Apartments and contact us for more information about current availability.